How Do I Merge Duplicate Jobs? 1. Go to the Reports section > Job Details Report > Unselect "All Jobs" radio box > select the job you want to transfer hours from > Generate a PDF report. 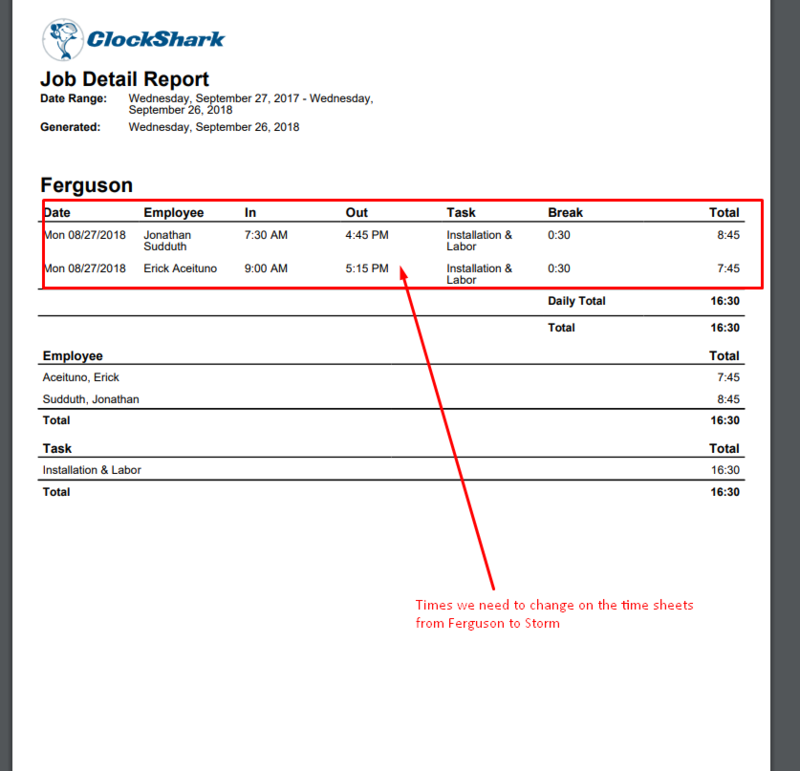 In the report, you will see the dates and times that need to be changed in the timesheets. In this example, we are changing the hours clocked towards the job Ferguson to the job Storm. (It is recommended to leave this report tab open to reference). 2. Go to Time Sheets > View Time Sheets and find the employees listed in the Job Details Report you previously ran. These are the employees whose time entries you will change. Once you find the employee, go to the date of the time sheet listed. In this example, we are clicking each time segment worked on the Ferguson job. 3. 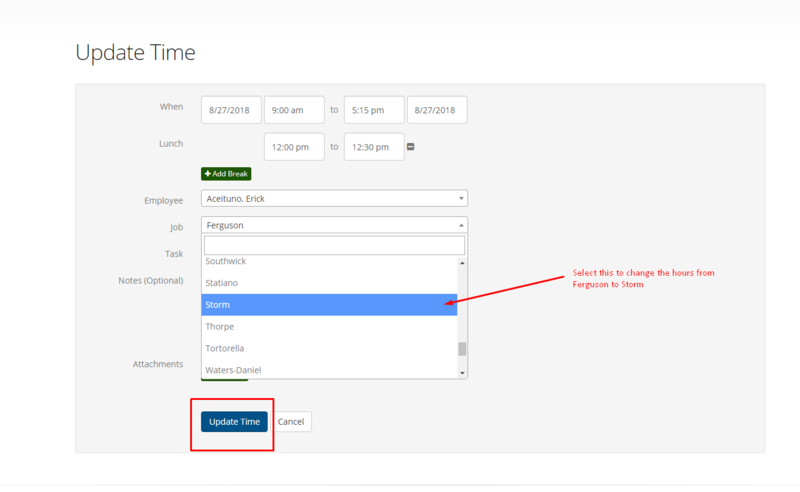 Select the time sheet and click the blue "edit" button on the time segment you want to change jobs/transfer over hours from. 4. Change the job to the correct job and click "Update Time". In this scenario, the job is changed from Ferguson to Storm. Note: you can repeat these steps for any other time segment listed in the report from Step 1 until all time segments are associated with the correct job. (For this example, the next time segment in the report belongs to Jonathan Sudduth). What do I do if the first job is mapped to a QuickBooks job? If you are integrated to QuickBooks, you will also want to go to the Mappings page and re-map the job. You can do this by going to Admin > Integrations > Manage for QuickBooks > Configure Mappings. 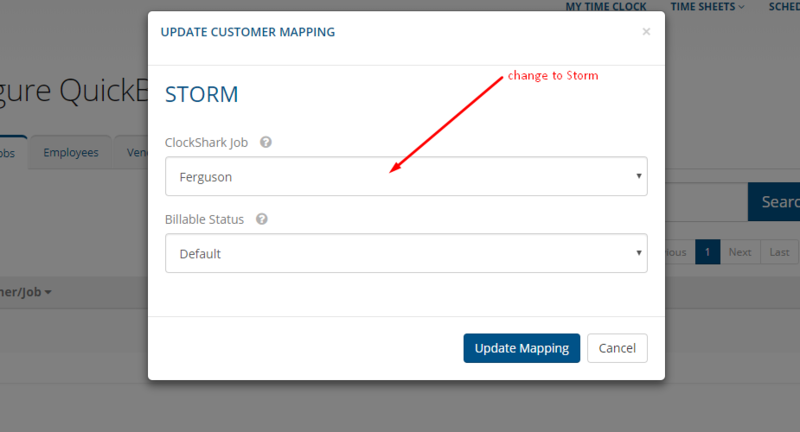 In this example, instead of Storm in QuickBooks being mapped to the job Ferguson in ClockShark, we will want to change it to the job Storm. This will need to be done before deleting the Storm job from ClockShark. Read more about adding jobs and tasks to ClockShark.